In Newark, the first Sunday in June for the past 19 years has been marked by the opening of the Portugal Week celebration, an event that started as a one-day tribute to the rich heritage of Luso Americanos. This is a time set aside to celebrate the accomplishments of one of Newark's and New Jersey's most vibrant communities. Largely a 20th century phenomenon, Portuguese immigration to Newark came not only from the mother country, but also from its former colonies and territories scattered throughout the world. Remnants of the empire are represented in the variety of people who join for the joyous week-long celebration that culminates in the Grande Parade. The event begins at 3:30 on the first Sunday afternoon in June along Ferry Street. Once again this Sunday, the Ironbound area of Newark will explode into a Portuguese version of Mardi Gras as vendors sell their wares and dancers in colorful native costumes perform along Ferry Street. Hundreds of floats, marching bands, drum corps, cheerleaders and stilt clowns will form the line of march. It has been estimated that Newark's population more than doubles during Portugal Day, from 267,000 to almost 500,000. The community Newark's Portuguese population, a number which has grown significantly in the intervening years, was estimated at 19,000, according to the 1990 U.S. census. As many as 150,000 people of Portuguese heritage may be living in Hudson, Union, and Essex counties. In Newark's Ironbound district, the Portuguese community outnumbers its Polish, Ukrainian, Spanish, Irish, German and African-American neighbors. While fishing is the main occupation in other Luso enclaves, like Fall River, Mass., coastal Texas or southern California, Newarkers are employed in the construction and retail trades, and service industries. Many immigrants also are self-employed. Over the past 50 years immigration patterns have changed, too. At one time most Portuguese settlers came from northern Portugal, by way of the Azores or Cape Verde Islands, or from places like Fall River. More recently many have emigrated from Brazil. Changes in the immigration laws and political upheaval in Portugal in the early 1970s brought large numbers of immigrants to Newark. With the opening of the European Union and the availability of work within Europe, the numbers declined. Institutions that have embraced the new Newarkers include Our Lady of Fatima Roman Catholic Church, considered the area's religious center, the Portuguese bakeries such as Coutinho's, Teixeira's and Vieira's, and the many Portuguese or Spanish-style restaurants that cater to a Portuguese diet. Portuguese language newspapers such as the Luso-Americano, and the daily arrival of Portuguese magazines provide a constant flow of hometown news. More than 60 social clubs, in many cases named for the members' hometowns, offer a daily reminder of the old country and acclimate the newcomer to American culture. The grandest of all these is the Portuguese Sport Club, which has more than 4,000 members. The $3 dues pay for the sponsorship of soccer teams and afternoon Portuguese schools. More than 400 students attend 15 different schools. Today's Ironbound community boasts Portuguese-American banks, construction companies, lawyers and law firms, and supermarkets that are among the largest in town. 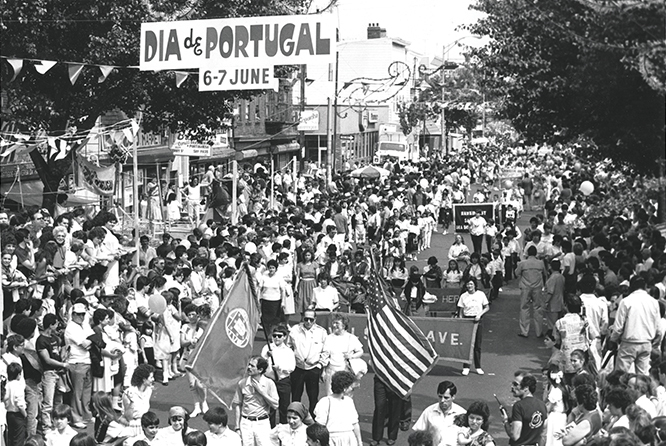 The importance of Newark's Portuguese community was emphasized in 1997 when the Portuguese Consulate General's office opened in the heart of the downtown business district. Portugal's Prime Minister Antonio Guteres presided over the ribbon-cutting ceremony in the lobby of Newark's Legal Center, welcoming Dr. Natercia Teixeira as consul general. To mark the occasion, a cherished statue of Our Lady of Fatima was put on display for a week in the Cathedral Basilica of the Sacred Heart. A series of cultural events, attracting people from all over the Portuguese world, followed at the New Jersey Performing Arts Center. An exhibition curated by Dr. Linda Rodrigues, whose parents were well-known Ironbound community activists, was on view at the Newark Museum. While each occasion would have been important individually, their combined effect illustrates a maturing of the Portuguese community as a major cultural force in the city. The first Portugal Day Parade attracted 10,000 people and was described as being exclusively Portuguese by its founder Bernardino Coutinho. 'Now everybody comes. And if you are not Portuguese, the Portuguese people will go out of their way to welcome you here.' So successful was the initial event that the second, held in 1981, attracted 50,000 to the 'Dia de Portugal.' Banners were strung across Ferry Street as the aroma of sausages and sardines filled the air, colorful flags swirled everywhere and clowns carried bouquets of balloons. The parade, accompanied by the East Side High School Band and Newark Police Department color guard, wound its way from Ferry Street to Peter Francisco Park at Pennsylvania Station. In 1982, rain didn't stop thousands from showing. Seventy-two groups, including 17 folk dance companies, participated. In 1984, sweltering heat failed to diminish the excitement of the parade. According to one account, 'many people could be seen going from one street food stand to another sampling not only the good food but the different varieties of port wine.' By 1989, a crowd of more than 100,000 was estimated to have attended the event. Mayor Sharpe James took the opportunity to showcase the Ironbound by hosting the Newarks of the World Reunion. Mayors and municipal officials from more than 20 Newarks—from California to Ohio to Vermont and on to England and South Africa—participated. In 1989, the parade celebrated the death of epic poet and historian Luis de Camoes. Asked the Portuguese ambassador to the United States: 'Is there any other country in the world that celebrates a poet and his work as a national holiday?' The 1993 parade grand marshal was Gov. Jim Florio. The Coutinho Foundation sponsored the festival that year with a budget of $100,000 and bestowed distinguished citizen awards on East Ward Councilman Henry Martinez and Avelino Torres, mayor of Marco De Canavese, Portugal. In 1994, an estimated 250,000 people attended the week-long event. By 1995 the number had reached a half million. That year 50,000 pounds of barbecued sardines, 30,000 pounds of chicken and mountains of potatoes were consumed in or along the route. In 1989, it was dedicated to the poet and historian, Luis de Camoes, Portugal's greatest writer. Luis de Camoes was born in Lisbon in 1524 and died there in 1580. His family, of noble ancestry, lived in Galicia but settled in Portugal in 1370. The poet's grandfather married into the family of the great navigator Vasco de Gama. His father was lost at sea while in service to the crown in a shipwreck off Goa in 1522. From 1539 until 1542 Camoes attended Portugal's University of Coimbra. Upon returning to Lisbon he fell in love with a beautiful lady-in-waiting to the queen. But his fiery love poems resulted in exile to Santar. He later enlisted in the North African service, where he lost his right eye in battle. In 1552, he was sentenced to prison for his involvement in a street brawl. Eight months later, he was pardoned by the king when he volunteered for service in the Far East. This journey took him to the other side of the world for 17 years. He was given a post of Trustee of the Goods of the Dead and Absent at Macao in China. As the result of charges of misappropriation and mismanagement of government funds, he was sent back to Goa to prison. Along the way the vessel he was sailing on went down in the Mekong River. He had to swim for his life, taking parts of his epic poem with him to safety. Pardoned once again, he tried to return to Lisbon but found himself financially stranded in Mozambique, where he continued working on his epic poem. By April 1570 he completed the 10th canto of the masterpiece 'Lusiadas.' After the Holy Inquisition's censor passed on the poem, he was granted a small pension by King Sebastian. Camoes' 'Lusiadas' is generally thought to be the greatest piece of Portuguese literature. It was first published in 1572, and is considered the great national epic. The poem, which has been translated into 17 languages, has three themes: the great glory of the Portuguese people, the pleasantness and beauty of the land, and 'the generous deeds of the country's princes on land and sea.' Often compared to Virgil's 'Aeneid,' 'Lusiadas' is considered as important and dear to Portuguese literature as Shakespeare's works are to the English. Once again, on June 7, Newark's Portuguese community will turn out en masse to pay tribute to Camoes, their beloved poet, and their rich history down through the centuries.